70 Minutes 08 secs. Tracks 4 ,8, 10 written by James Asher. Tracks 2, 6, written by James Asher and Sandeep Raval. Tracks 1, 3, 9 written by Carolina Maggio, James Asher, Sandeep Raval, Simon Brewin. Tracks 5, 7, 11, 12, 13 Written by James Asher, Sandeep Raval and Simon Brewin. 73 Minutes 37 secs. Track 1, 2, 5, 7 written by James Asher, Sandeep Raval and Simon Brewin. Track 3 written by Carolina Maggio, James Asher, Sandeep Raval and Simon Brewin. Tracks 4 and 6 written by James Asher. When you turn on this album, energetic sounds burst into the room and captivate you from the first moments. In the pulsating sounds of percussion, passionate vocals, excited guitar chords and soft keyboards one can hear the movement of life itself. In general, a diversity of various drums is a special feature of this double CD album. Its music is very earthy and at the same time has a space origin. Brilliant multi-percussionist Sandeep Raval and outstanding keyboards and drums player James Asher cross diverse cultural divides with incredible easiness. Expressive vocals of Carolina Maggio and poignant guitar of Simon Brewin help to create a special atmosphere of the album, mixing different cultural traditions into one pot of universal rhythms. The music of the album “Drum Travel” has a lot of different bright colors. Jazz rhythms and world beats, modern and ethnic tunes, folk and even shamanic motifs and many more influences from new age and meditative to trance and dance are interwoven in the refined compositions of this project. Drum Travel is the mind-boggling double-CD collaboration by percussionists James Asher and Sandeep Raval. Disc 1 celebrates the diversity of drumming and Disc 2 is subtitled TIPI Experience, traveling even deeper. Both artists have a lifetime of experience as musicians as well as composing for a vast array of music media. The music on this album contains a staggering range of musical styles that include Worldbeat, Latin, Ecstatic Dance, Shamanic, Jazz, Blues, Indian folk, Meditative, and Native American. Adding to this musical melange are vocals and charango by Italian singer/songwriter Carolina Maggio and bass and guitar by Simon Brewin; both co-composed many of the pieces. Ten other musicians plus The Gathering Sound Community Choir contribute with a variety of instruments and voices. This project was a huge undertaking, taking eighteen months to complete. What a triumph! In the liner notes, the artists invite you to: “Dance to the drums, play along with the drums, meditate to the drums, but most of all enjoy the musical freedom that a deep love of drums invites, and find and enjoy your own travels with some compulsive accompanying scores.” Take heed, because this is an amazing musical experience! Disc 1 consists of thirteen tracks that represent the music of many cultures. Some of the shorter tracks are drums and percussion only and will get the heads to bobbing and the toes to tapping – if not up and dancing! I find those high-energy tracks especially compelling, exploding with the pure joy of musical expression. Carolina Maggio’s magical vocals soar on four tracks that she co-composed, singing in several different languages – I love “Fugira” and “Neptune Skank,” which is an infectious mix of rhythmic musical styles. “Beside the Blues,” “Breaking Good” and “Chilli Pickle Chaser” feature Simon Brewin playing jazz electric guitar that really cooks. “Pappadoms from Persia” takes us to the heart of the Middle East while the fourteen-minute “Seven Veils” tells an exotic and sensuous tale of mystery. Disc 2 consists of seven tracks that are again very diverse, but none of these are percussion only. “Los Cuentos” is a beautiful instrumental with an easy rhythm and haunting melody. “Hey Wanaina” has a very strong Native American influence with drums, choir, and bass guitar and Carolina’s chanting/singing. The remaining four tracks range from eight to thirty minutes, allowing the listener to become drawn into the music for a longer and more sustained period of time. “If the Earth Could Speak” has a powerful, emotional intensity that I find compelling – love it! “On the Outbreath” is the 30-minute closing track and is quite a journey unto itself. Dark, exotic and mysterious, Middle Eastern instruments and rhythms plus wordless vocals enchant and mesmerize, transporting the listener to a different realm. There is really no other music that I am aware of that compares to what James Asher and Sandeep Raval have graced us with. At nearly 2 1/2 hours and twenty tracks, there is no filler whatsoever. If you are feeling musically adventurous and ready to try something new and exciting, I highly recommend Drum Travel! It is available from Amazon and iTunes. Check it out! A whole host of players joins James percussion, keyboards and various other instruments on this most pleasant excursion into the upbeat and inspiring journey across various styles of all-original music that will hold you spellbound through it’s entire 140 minute length. I was especially entranced on pieces like the 5:22 “Beside The Blues“… very nice jazz flavors, but it holds true to the “drum” focus you’d expect with a CD title like this (Simon Brewin’s guitar and bass make this one feel very “uptown”, if you will). The other thing that makes this double-CD such an attraction is the flawless recording… nothing is left to chance, and every little nuance is easy to hear… of course, for your first few sessions I would recommend that you listen with headphones on! If you’re interested in pieces that allow you to stretch out and improve your mental posture, you’ll find the 8:08 “If The Earth Could Speak” very much to your liking – in point of fact, it’s my personal favorite of the twenty high-energy tunes offered up for your enlightenment. Total talent and inspiration for the joy that music can bring allows me to declare this great sonic adventure a MOST HIGHLY RECOMMENDED, with an “EQ” (energy quotient) rating of 4.99 (very near the top of my scale). “If The Earth Could Speak” is the first track I heard and was so taken with it I featured it on Rate The Tracks and to no surprise it jumped to the #1 position on the charts within a day and it continues to get plays. The title is quite prolific and so is the music. Everything that is good about what these people do when making music comes flowing forth like a river with a definite path to the ocean. It has meaning, beauty and first and foremost touches your spirit in a way that is most memorable. World Music and percussion fans, be forewarned: when pressing “play” on the new release by James Asher and Sandeep Raval, keep a firm grip on you socks so as not to have them knocked clean off. I was about to say that “this is one seriously powerful recording,” although the reality is that is actually two recordings – a double album; something you don’t find very often these days. But Drum Travel offers some of the most mind-blowing, earth-shaking percussive energy and cross-cultural influences that I have encountered in quite a while. James credits UK based multi-percussionist Sandeep Raval as being “very helpful in both increasing my understanding of the (Indian) music, and introducing me to many excellent Indian musicians in the UK.” In addition to collaborating with James on Drum Travel, Sandeep also has other albums to his credit, including Worship Through Sound and Mosaic in Motion. He also played an invaluable part in the production of Andrew Lloyd Webber’s acclaimed musical, Bombay Dreams (scored by A R Rahman – Slumdog Millionaire). Sandeep has performed on stages around the world, and is proficient on a wide range of percussion instruments in many genres. Together Sandeep and James make for a formidable collaboration that blends diverse cultural and stylistic influences into a mesmerizing musical mélange that includes Worldbeat, Latin, ecstatic dance, shamanic, jazz, blues, Indian folk, meditative and Native American. As the curtain rises on the first of the two discs, the intro to track one, “Fugira,” with its drums and bass, flashed me back to Santana at Woodstock with their epic version of “Soul Sacrifice. But it soon evolves into it’s own unique direction, which does include some propulsive rhythm guitar by Simon Brewin, who also plays bass on the album. It additionally features Italian language vocals by Carolina Maggio, who is an integral part of the recording, particularly on the second disc. This is followed by an all-drums and percussion piece called “Takita,” that lays down a funky and intricate groove. “How It Feels” is another vocal track featuring Carolina, this time in English, that while also percussive, has a more orchestrated feel than previously heard. It’s not hard to imagine from the title what the percussion-only vibe of track four, “Bring on Brasil,” might be. This is one of a number of shorter, approximately two and half-minute pieces that are like sonic sorbet between some of the longer tracks. Despite it’s title and bluesy chord progression, “Beside the Blues,” is actually quite jazzy with its Wes Montgomery/ George Benson-style guitar octaves. Along with some tasty lead guitar and fretless bass solo, this tune is a nice up-tempo showcase for the talents of fret-master Simon Brewin. Also in this vein is the smoking hot “Chilli Pickle Chaser.” James and Sandeep throw all kinds of percussive and cultural ingredients into their musical mixmaster on “Percussive Kitchen” and “Drums for the Dragon.” Without the inclusion of any melodic instruments, the phenomenal drumming skills of this dynamic duo really stand out. According to James: “We make a good team. Sandeep does the flowery energized and technically challenging parts while I keep the backbeat going and am thinking of the overall shape etc.” Sometimes it is hard to tell who is playing what, but suffice it to say James and Sandeep are both master drummers in their own right. After an intro of spacey synthesizers and down-tempo chill groove, the music breaks into a reggae beat with Italian spoken word and sung lyrics by Carolina. I had been waiting for a song that highlighted the tabla drum virtuosity of Sandeep Raval, and a track called “Pappadoms from Persia” delivered it on this fast-paced Eastern-flavored composition. Very tasty! The last two tracks, “Breaking Good” and “Seven Veils” are the longest on this disc at approximately ten and fourteen minutes respectively, and allow the ensemble to stretch out to explore diverse and exotic musical landscapes. All in all, Disc One represents quite an eclectic collection of tunes with stellar performances by all involved. According to the liner notes: “On the second disc, subtitled TIPI Experience, “the rhythmic journeys deepen. Drum Travel draws on many profound rhythmic traditions to illustrate the ability of drums to ease and empower transformative personal journeys that can have extraordinary and life-changing impacts on the traveler.” As mentioned, Carolina’s presence is particularly felt here on songs like “Neptune Skank” and “How It Feels” on which she plays a small Andean stringed instrument called a charango that is similar to a ukulele. A different cultural, yet equally earthy vibe is conjured on “Hey Wanaina” with its tribal drums, Native American chanting, and addition of The Gathering Sound Community Choir. Powerful percussion and orchestration combine on a fast-paced tune called “If the Earth Could Speak.” As the title implies, a song called “Accelerando” starts off leisurely and gradually picks up speed featuring an interesting vocal interpretation by Praful Dave. One of my favorite pieces on this disc was “The Great Transition,” that highlights an intricate arrangement and diversity of instruments. Incidentally, in addition to the four core members of this group, at least ten other musicians make appearances on various tracks, including world-renown drum circle leader Arthur Hull. At a half hour in length, the final song, “On the Outbreath,” is the most ethereal piece on the album and makes for a wonderfully dreamy meditative experience. 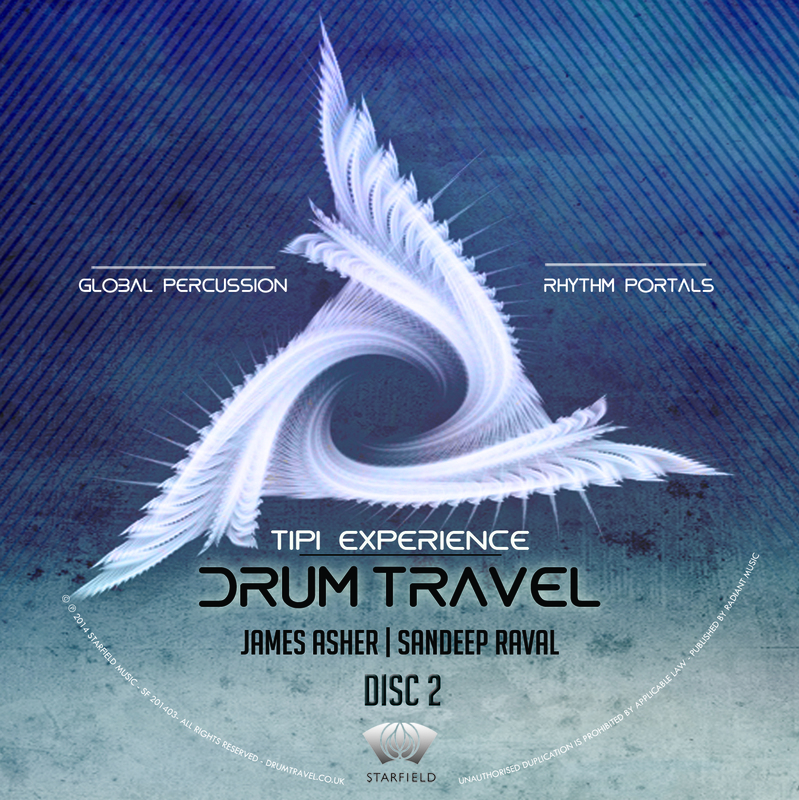 As someone who appreciates percussion and rhythm, I can’t speak highly enough about the incredible talents of James Asher and Sandeep Raval. Both are highly accomplished drummers and the synergy of their work together is even greater than the sum of its parts. The intricacy of their patterns and the way the two musicians flow together builds a convincing case for the existence of telepathy. They also both play keyboards on the album, and as mentioned, there are stunning contributions from Carolina and Simon as well, but as the title alludes to, drums are king here. And its not only the skills and percussive dexterity James and Sandeep have built up over the years, but the wide range of musical styles they apply them to throughout the recording. Also, as the title hints, Drum Travel would be the perfect music for driving or a road trip, as well as for dancing, exercising, moving meditation, or just an exhilarating up-tempo listening experience. 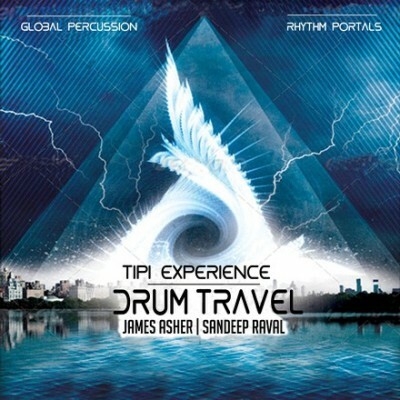 Drumming is like the heartbeat expressed in music, and James Asher and Sandeep Raval energize this pulsing multi-cultural body of work with life force and sonic spirit. Musicians:- James Asher – Keyboards, drums, percussion, hammered dulcimer, kitchen. Sandeep Raval – Multi-percussion, keyboards, wicked ginger, vision. Simon Brewin – Bass, Guitar, Wit, The discerning don. Carolina Maggio – Vocals, charango, painting, creativity and enthusiasm. Also, gratefully acknowledged:- Arthur Hull – Congas. Tom Fairbairn – Violin. Zuwa – Vocals. Waquas Choudary – Bansuri. Kankana Banerjee – Vocal. Praful Dave – Vocal. Unnati Dasgupta – Vocal. Hardik Dave – Melodica. Ilyas Khan – Sarangi. Darshan Raval – Cahon. Choir on Hey Wanaina – The Gathering Sound Community Choir. Arranged and conducted by Richard Leigh. Many thanks for a great job, Richard. On the second disc, the TIPI experience, the beats deepen to draw on profound, life-changing rhythmic traditions further uplifted by the unique singing and song-writing of Italian singer/painter Carolina Maggio and the phenomenal musicality of guitarist and bass-player Simon Brewin.